The word “rak” comes from the Norse word “rakr”, meaning moist or soaked. It descends from Indo-European “req”, which mean source or drop, which is also related to the word rain and you can find the word in irrigation. The rakfisk is put into a bucked and then fluids (with ocean salt, a bit of sugar and water) are formed, it is brined. In the oldest sources, on the other hand, the rakfisk is mentioned as “brine- cured fish”. And of course, originally the fish was buried or put in underground cellars. The supposition for this conservation method is an even soil temperature at about 4 degrees Celsius, and that’s why the tradition is found around the polar circle at the northern hemisphere. Fish for raking is salmon, herring and shark in addition to the gwyniad. Trout/char are the most commonly used today. Mind the carafe or decanter to the left of the Aquavit bottle: Its a shot glass on top with your personal doze in the carafe. You all know I love comments as it enriches the subject to hear the reactions from all over the world. If you know of similar kind of foods from your country, I would love to hear about it! Oh how wonderful. I am so happy you wrote about this and that you took so many pictures! Everything looks o good. I bet I would LOVE it! All my favorite types of foods! I know you would love it Maribeth; Coming from a seafood district of US too – hope one day you and your husband can come over and eat this together with us! Fermented but still fresh – yea :-) Glad you got the feeling from my description and the pics – maybe one day you can come and visit and taste too! I love the idea of ‘slow food’ – lots of socializing and enjoying the food and the conversation. Thank you for sharing your delicious feast. You got it: Socializing is a key word here! That liqueur is great and the Finish is best! so am i to guess from the pictures that there is a particular type of aquavit that is supposed to go with the rakfisk, not just any kind of aquavit? How observant Lime!! There is different kinds and various from districts and for different kind of food! Excellent presentation of food, culture, and family. Your welcome – always great to welcome new readers and thank you for the compliments! The Rakfish looks so yummy! It’s the first time I’ve heard of it. Oh boy! I want to try this dish! The almond potatoes look unusual, I don’t see them in our supermarkets. I knew you would love it – come, visit and try! Almond potatoes is a typical mountain potato and grows well in Norway you know. You were right, Renny. I was already hungry before I read your post and now I’m starving! Everything looks delicious, and I’d love to try the cloudberries and whipped cream. We’re much too far South here for them, but we do have lots of other berries, like blackberries, blueberries, dewberries, loganberries and mulberries, just to name a few. I knew, so I had to invite you over of course. Wish you a great one too Diane! That looks very yummy, something to copy, although I am not sure to get rakfis here in Brussels. But I have something for you today, a Belgian beer museum ! Quite amazing ! I’m over to visit then! A great tradition it is, sitting around the table for hours with Rakefisk. 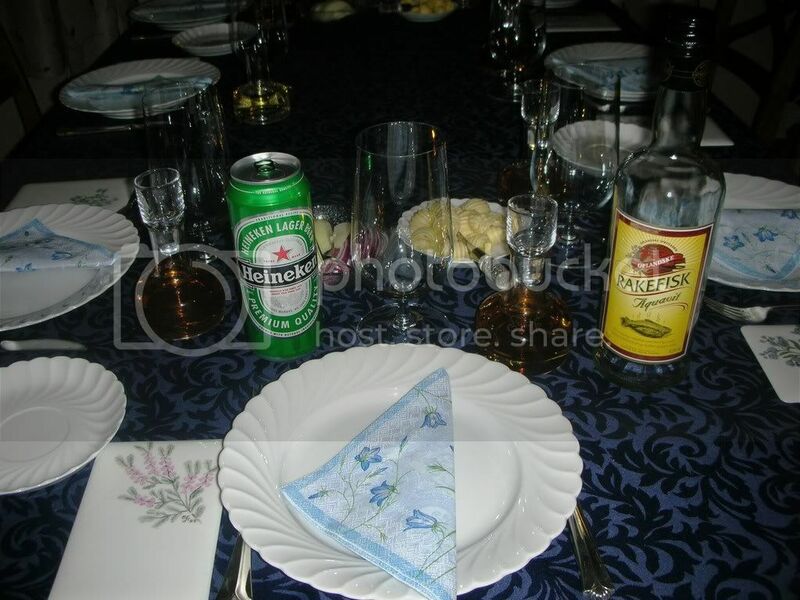 The only risky thing here is the Aquavit;)) if you are not used to drink it. LOL. The Rakfisk looks delicious and is quite the tradition! Thank you for sharing part of your culture. Yea, one of the most traditional or special you can get in Norway I would say – that’s why I love to share it with the rest of the world you know. It’s just lunchtime here in Charleston and you made me really hungry now with all that good stuff…mmmhhh! I’m a big fish lover and we have a lot of fish on our table too. Very nice, interesting post and great pictures. Hope you’ve had a good lunch then and glad we share the passion for fish too! Wow…I could stay here at this table all night eating and drinking…you make everything look so appetizing! Mahalo for sharing your tradition and culture! Thanks for the visit, you know I love to share our traditions! Its fun and I also think it is important to hold on to that kind of tradition and gathering – ‘Slow food’ has a deeper meaning you know and in the urban and stressful life, it’s easy to forget to make memorable and quality time. We seams to run away from ourself. Yum, yum, can I come over for dinner? It looks so good. I love Salmon. Oh, the deserts they look so good I could just about taste them. What a feast! Thank you for all the pictures. I think I would have liked being a Viking just for the food! LOL! I have some thing for you at my site. Tell me when you are coming to visit and I’ll try to find more Rakfisk (the season is over so hurry up!). Thanks for you Blogsphere gift to me – its collected already in my Award page! Renny, those are delicious. I think that Salmon taste better uncooked…though I cannot convince my family to eat it until it’s been overcooked! I have gotta make it to Norway, and we’re stopping by your place so you can take us to all these yummy places. You know your welcome any time – I’ll glad show you around and have a feast with you! these dishes look wonderful Renny !! Well, I’ve had barbecued tuna fish in Australia when visiting more than 10 years ago and that was great! I can’t help noticing how big the egg yolk is!!! Egg is good for milden the distinct fermented taste. 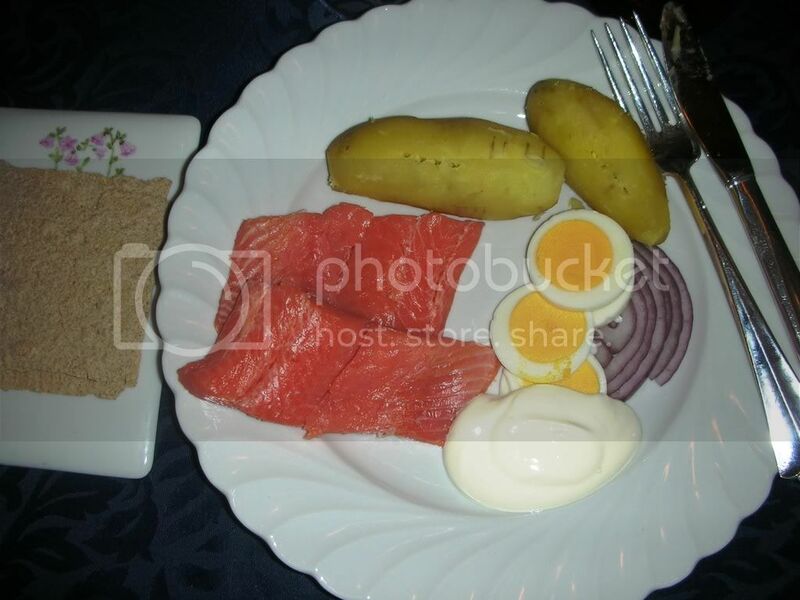 I havent tried rakfisk but I did try lutefisk during Christmas and I think it was really gross so I concentrated on eating the svineribbe instead. But the rakfisk looks nice! I think you’ve already been digging in quite well to the traditional Norwegian food then Chase – so next time rakfisk then! Oh my. I love, love, love (emph on love) this post. This is sooo my kind of food/drink. I’m on my way over, k? Loving you, loving food – your of course welcome over any time! Thanks for your lovely award too – I’ve collected it on my Award page! Wishing you a good one too – hubs back! Great to welcome new readers and thanks for joining the Big Bang list! Thanks for your compliments though – I always want readers to learn something from my post! Thank you for sharing. I had this before at a Norwegian festival. I haven’t visited the Norwegian area for a while. I love eating raw salmon. Your welcome – always great to share with new readers too and specially those who love see food. Tell me when you are coming back to Norway as I would love to meet you! This looks delicious Renny and one day I hope I will get the opportunity to eat Cloudberries. It is just a touch too hot for them to grow here in Australia. Glad you liked it Sue. You have to come and visit one day, so I can serve you some cloudberries! A simple looking meal but something I would choose over many five star menus in restaurants. Thanks, I take your word for it as I know you are a traveller and an expert Sidney. It ALL looks and sounds quite delicious, Renny…..The Almon Potatoes sound particularly yummy….! I love that this is a leisurely meal and that there is no rushing…And so much sharing with each other, too! The desert looks quite marvelous too…..! I very much enjoy ALL your pictures of foods that are traditional in your country! Thanks Naomi and yea, Almon Potatoes is a must. Yea, slow food dinner is recommendable – glad you liked the whole menu! Awesome site that you have here. I’ll be coming back regularly. I’m craving now to eat the delicious food in the pictures. You see, I love eating!!! Thanks for your compliments – always great to welcome new readers – welcome back any time! Hi! Here in Brazil we eat the grilled salmon and hardly or never we eat Tubarão. Dom sea we also eat linguados, badejos or cherne and some small ones. Water abundant candy, fish, mainly tilápia and trouts! I liked its porcelain and the way as it presented plates. She always comes that to want! Hi Luma! Always great to meet new visitors and I don’t think I’ve had that many from Brazil, so you are very welcome! Thanks for sharing your food traditions too – I love it – that enriches the subject! Good to see you like sea food too! You know I’m a shameless non-eater of fish but I’d join you for dessert and coffee…and conversation! I know Ruth, but knew you would love the dessert and enjoy the conversation! It sounds like a lovely family tradition and wonderful to cherish. I didn’t know Aquavit is a distilled beverage from potatoes! the things we learn through blogging.. It is interesting to read the origins of the Raskfisk. 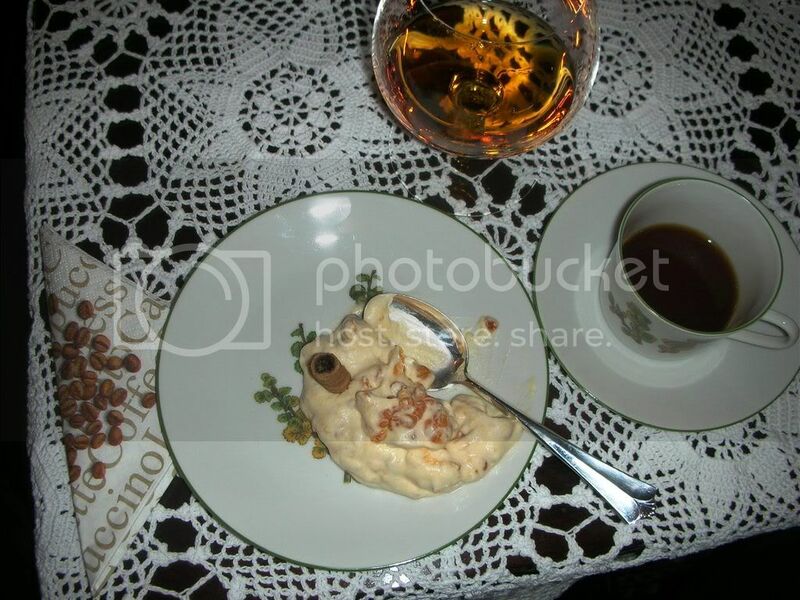 I am not much of a fish eater nor Aquavit lover but truly enjoyed your post and I could almost hear the conversation around the table and the sound of silverware and porcelain. Cheers! It is – family quality time. Glad I can learn you something and in that way BlogSphere is great – like reading your blog too! It’s the combination that makes it smashing you know – and of course the socialisation aspect – Cheers to you too! The great thing is that not only are you enjoying your food and socialising within your family, but you’re sharing your food with the greater blogosphere and we can all join in the socialising too. Wonderful meal, mouth watering! Hey that’s some good looking food there. Thanks for sharing the history there Renny, very interesting.. Your welcome Grish – glad you liked it too. 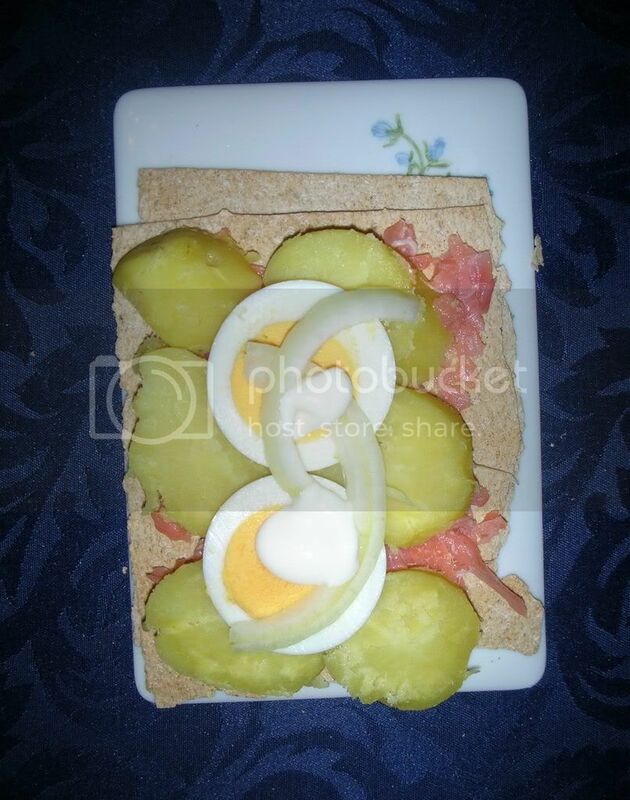 May I compliment you on the excellent presentation on rakfisk! I live in America an a relative just brought me some rak oerret from Wangsten in Valdres. I have never eaten rakfisk but have heard much about it also about its pronounced smell. The Wangsten product looks beautiful pink in color and shrink wrapped – so no smell. In the transit from Norway the Wangsten package might have been out of refrigeration from time to time. Could this present a problem? As you might have guessed, I am concerned about food poisoning. Is the any danger of that? I would greatly appreciate your comments. I shall be looking forward to your comments. Thanks for the compliment Olaf (a very Norwegian name!) and how nice that you have relatives who can bring you rak ørret from Norway! The smell was bad sometimes in the old days, but seldom nowadays as they are better in the fermenting process and Wangsten is know for excellent products. Since I don’t know eventually how long time it have been out of refrigeration, its hard to say, but I don’t think there should be no problem. Bone appetite and it would have been nice if you could tell me if you liked the rak ørret. Looks like another awesome meal. Would love to try it sometime. Do you make it yourself or purchase? And, did you know when you google “rakfisk” you are #2 on list – only after wikipedia’s entry. I’m thinking of the typical food. It has to be delicious. I would really like to know the true cuisine of Norway as you teach in your blog. Some typical family restaurant. I also think that here in Spain we have products with denomination of origin, world-renowned products such as ham, olive oil, etc … I would love to know what the Norwegians. Renny you are very kind. I hope to be with you in August. I’m a little scared because I know no one and my English is not perfect.